Gazi is now a well known area for its nightlife, restaurants and for the cultural quarter of Technopolis. However, back to 2002, when this great restaurant opened its doors, Gazi was just an area with lots of car workshops and garages. It looks like the whole area is changing with new buildings and new bars while Nezos feels like it’s a leftover from the past time. 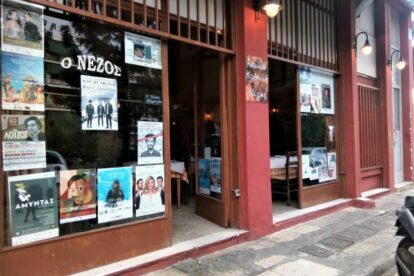 Nezos is an Asia Minor restaurant famous for its kebab and the very good prices. You can eat, drink, feel full and pay just about 10 to 15 euros per person. The kebab is indeed delicious as well as the chops, the Asia Minor salad, the beetroot and the pastourma. I love going there with a big group of people, order almost everything on the menu to share and drink some nice wine or tsipouro (a.k.a raki). If you’d like to get an idea of the old Gazi, taste one of the best kebabs in Athens and enjoy a night of eating and drinking this is a great spot for you!